The perfect chestnut tree for one chestnut producer may not be the perfect chestnut tree for someone else. From the top we have to look at the consumer's bias resulting in defining the market for chestnuts, the growers expectations, the locality of the chestnut farm and things that can cause problems with getting chestnuts to market. That is just 4 things we need to consider when selecting a chestnut tree for commercial production. How is it that these 4 simple things can result in a very difficult task? Let's examine each of these as a whole instead of just a quarter of the entire problem. We will start with the end first and work our way backwards. The end is when the chestnuts we have produced have been processed and are ready to be consumed. The beginning is defining the market we will be producing for. The location of the orchard may have already been determined by where you live with a few exceptions. Grower's expectations are almost always well above what the average grower actually experiences. Grower's expectations can be things like producing X pounds per acre every year; 100% of the nuts are at least X inches in size making them all larges without cracks in the shell; all the chestnuts fall on the same day each year; rains come and deliver the exact amount of rain to have a great harvest; chestnut prices per pound are 1/100th of the price of an acre of land; no bugs, or other bad things attack the chestnut trees; and prime chestnut tree farm land sells for $500/acre. This is a perfect list ready for many shortcomings. Now lets convert these expectations to requirements for a chestnut tree. The price of an acre of farm land is an important piece because the chestnut producer will need to receive enough revenue from that acre to be compensated for the investment in the land. The availability of water is also very important no matter if the water is pulled from a lake, a river, or the sky, chestnut trees need about 24 – 40 inches of water during the growing season. In the Pacific Northwest, about half the water comes from water in the soil from the winter rains. The other half come from rain during the growing season and irrigation. If water is a problem then selecting a chestnut tree that can produce even when there is water stress is important. Yield is a term businesses use to describe the percentage of units good enough to be sold. The yield does not include products made but could not be sold. For chestnut producers yield is defined as pounds per acre of nuts meeting the requirements of the minimum to be sold. The goal is produce something very valuable from nothing. Chestnuts require inputs to achieve maximum yields. 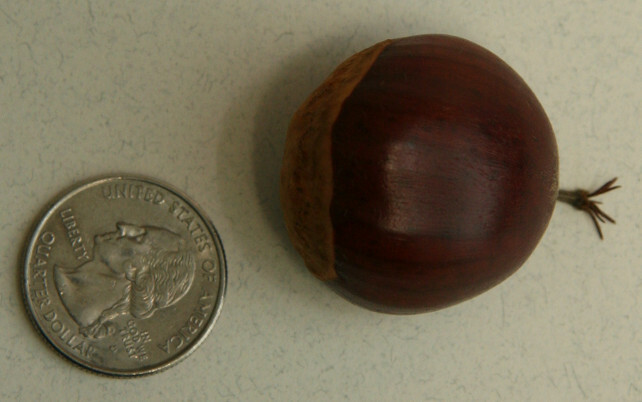 These inputs are X square feet of land, water, fertilizer, labor for orchard maintenance and harvesting, and any other resource needed to produce chestnuts. For many growers the minimum yield is going to be 1200 lbs of nuts that can be sold to the acre. This is what will be required to recover the input costs. The yield range of chestnuts is between 0 and 6000 lbs to the acre. For low intensity orchards with trees 12 or more years old the average yield is about 1200 lbs to the acre for Chinese chestnut trees and about 2000 lbs for European hybrid trees. Using high intensity practices chestnut trees have produced as much as 6000 lbs to the acre. When choosing a chestnut cultivar for commercial production, the yield is almost as important as nut quality. Nut quality has many key components with the top components being nut sweetness, nut size, ease of peeling, nut shape, nut color, and the texture of the kernel. Consumers are always requesting large sweet nuts, leaving some of the other attributes out of the discussion. A great business is always going to go beyond what the consumer asks for by delivering nuts delivering good results in all the attributes. Without asking, consumers expect the chestnuts will peel easily. This one attribute is a make or break deal changer for the chestnut producer. 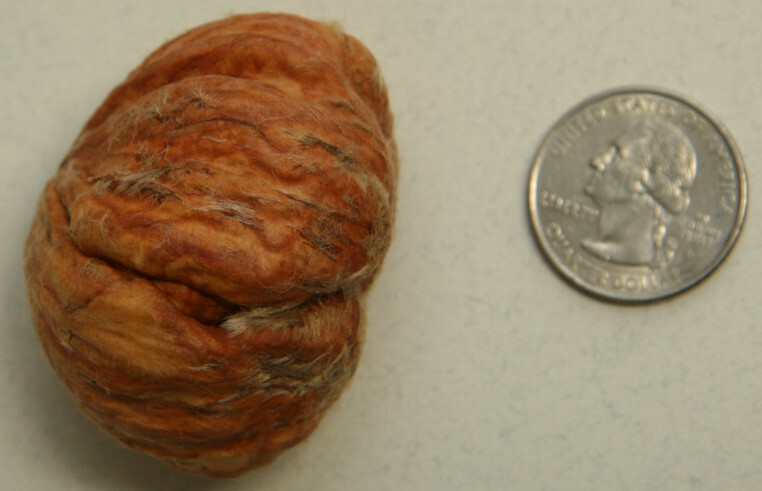 Chestnuts have booth an outer shell and a pellicle protecting the chestnut kernel. Ease of peeling a chestnut includes removing both the shell and pellicle from the kernel, but mostly the pellicle as it can adhere to the kernel (aka Pellicle adhesion to kernel). 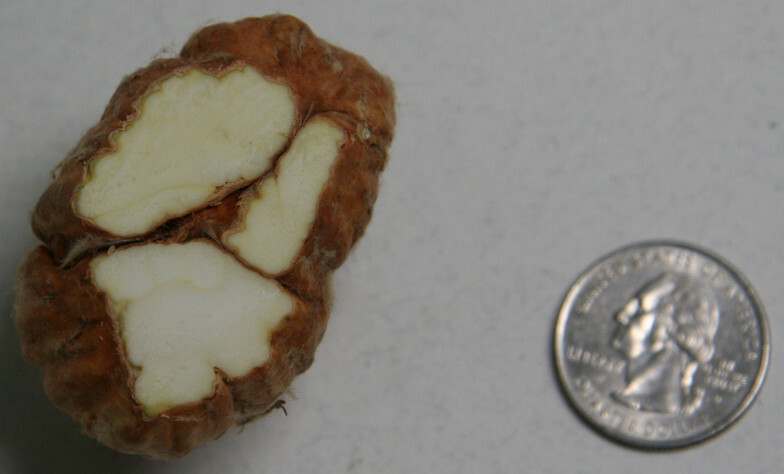 This is what a not so good chestnut kernel looks like inside the shell. It has deep valleys causing pellicle intrusion. Most growers will claim their chestnuts are very easy to peel. Before settling in on a primary cultivar for your production, buy a few pounds of the cultivar from another grower in the area and check to see how the nuts taste and peel. In addition, check the size of each nut and calculate the number of nuts per pound. Chestnuts destined for fresh market will need to be 1 1/8 inches (a standard for a large) or larger (about 32 nuts per pound). The cultivar you choose for your primary producer should be able to produce 90% large nuts without cracks in the shell. There is a softly spoken secret with chestnut production, “Chestnut trees produce the same tons per acre, be it a lot of little chestnut, or fewer large chestnuts”. Getting the chestnut trees to produce large chestnuts is challenging and labor intensive. If you are going to produce a high quality sell able product then you will have to work at it, it is not going to happen magically with no effort. 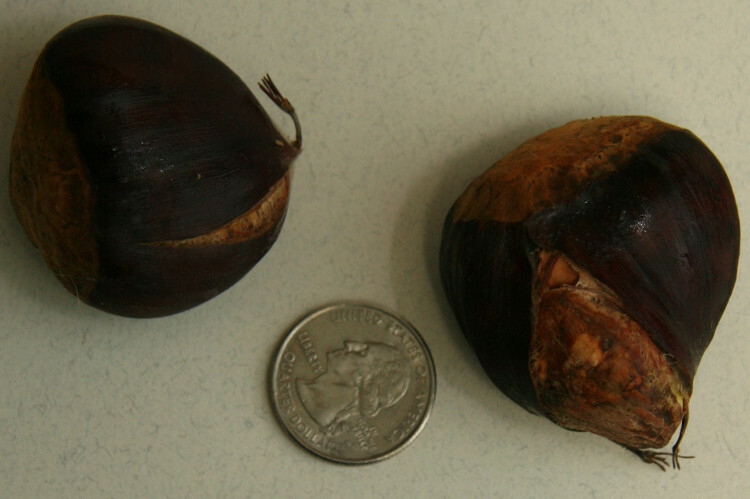 Chestnuts smaller than ¾ inch are trash and unsellable except for use feeding animals. Chestnuts between ¾ inch and 1 inch can be sold as “Small” and people buy them but not enough to target as a producers primary market. Any chestnut with a crack is trash no matter how large it is. Cracked chestnuts usually go bad much faster than chestnuts without cracks. There are two more aspects of chestnut quality to look at. 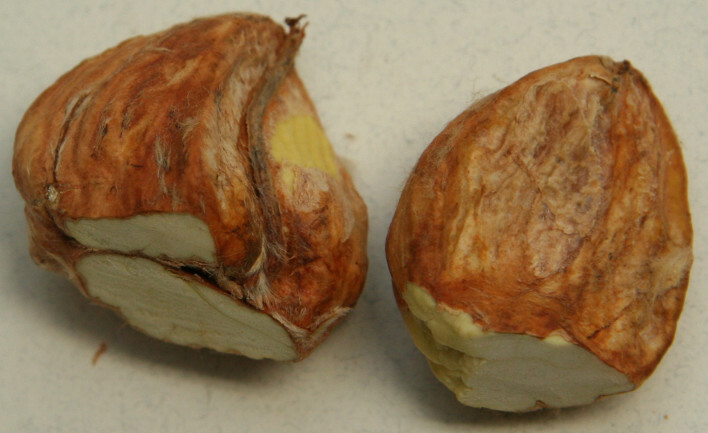 Some chestnut cultivars have a tendency to produce multiple kernels in the nut. The kernels are separated by the pellicle. There is another quality issue referred to as pellicle intrusion. This is where the pellicle follows a valley into the chestnut kernel. For some chestnuts for fresh eating where the nut is very, very, very, easy to peel, this is not much of a problem. If the chestnuts are going to be made into flour or other product this pellicle intrusion reduces the quality of the product. If there are no other growers in your area to glean information from, your efforts will be what is called a pioneering effort. Since there is not another source for chestnuts in your growing area to compare then you will need to take a few trips to neighboring areas to find chestnut producers. The farther you have to travel the higher the risk of selecting a cultivar that may not work well for your farm. The best way to mitigate this risk is to select several chestnut cultivars (grafted trees) to test on your farm. To test a cultivar you will need at least 5 trees of each one being tested. If takes at least 5 years for the grafted chestnut trees to get to a size that will give results that is consistent and measurable. Because each growing year has variances the testing period may need to be extended out to 8 to 10 years. This is the dozen of basic rules for getting started with becoming a commercial chestnut producer. Adding to this list would only create road blocks for people interested in becoming commercial chestnut producers and would not likely hold true for all chestnut producers. Keeping chestnut trees happy and healthy is not much different than keeping a garden happy and healthy except it is on a much larger scale and time is measured in years instead of days to harvest. Now lets get back to the issue of the marketing the chestnuts. This is the one area most growers overlook or hand to someone else to take care of for them, a broker or co-op is often chosen. The questions of how to dispose of the chestnuts is often asked with, “Where am I going to sell these chestnuts?” If we are going to market our chestnuts the question is asked with, “Who purchases these chestnuts?” Several Universities in the US have performed market research looking at the market for fresh chestnuts over the years. The results of this research gives us a good idea of who, as consumers, buys fresh chestnuts. The answer is not simple but several general observations can be presented. So this is who is purchasing the chestnuts, we still have to answer the question of “How are these chestnut consumers purchasing their fresh chestnuts?” If we look at the volumes of chestnuts sold in North America each fall, we find most people are purchasing their chestnuts from a local grocery or specialty store. These stores have two options for purchasing fresh chestnuts with the most commonly selected option is a grocery distributor such as United Natural Foods. The other option, requiring much more work on the part of the produce buyer, is purchasing from a local producer. The local producer has only one thing going for them when selling to a local store, there is a giant way passing through North American call “Buy Local”. This means that produce buyer has to keep the consumer happy by following this trend so he or she can say “Yes, this is locally produced.” How lucky is the local chestnut producer with the “Buy Local” movement. What does this have to selecting a cultivar? In a way not much, but if we want the consumer to purchase chestnuts many times over their life times then the chestnut producer has to deliver a quality product even if the consumer has no idea what a good chestnut is. To be successful, the chestnuts you sell into your market must meet or exceed the consumer's expectations. The expectations were discussed at the beginning of this article. © 2014 - 2017 Washington Chestnut Company All Rights Reserved.